The last thing Katie Bonner wanted was to become the manager of Artisans Alley. But when her business partner Ezra Hilton is found bludgeoned to death, she has no other choice. Business under Ezra had been faltering - but was it enough to provoke someone to murder? Only Katie can find the answer. When she moved to Stoneham, city slicker Tricia Miles met nothing but friendly faces. And when she opened her mystery bookstore, she met friendly competition. But when she finds Doris Gleason dead in her own cookbook store, killed by a carving knife, the atmosphere seems more cutthroat than cordial. Someone wanted to get their hands on the rare cookbook that Doris had recently purchased-and the locals think that someone is Tricia. 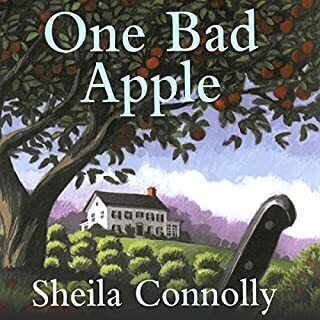 Meg Corey has come to the quaint New England town of Granford, Massachusetts, to sell her mother's old colonial home and apple orchard. Instead, she becomes embroiled in development plans that include her land - and her former flame from Boston. When he's found dead in the new septic tank on her property, the police immediately suspect Meg, whose only ally in town is the plumber Seth Chapin. Together, they'll have to peel back the layers of secrecy that surround the deal in order to find the real murderer. Honoring the wish of her late grandmother, Maura Donovan visits the small Irish village where her Gran was born-though she never expected to get bogged down in a murder mystery. Nor had she planned to take a job in one of the local pubs, but she finds herself excited to get to know the people who knew her Gran. In the pub, she's swamped with drink orders as everyone in town gathers to talk about the recent discovery of a nearly 100-year-old body in a nearby bog. When Houston reporter Lucy Resnick cashes in her retirement to buy her grandmother's farm in Buttercup, Texas, she's looking forward to a simple life as a homesteader. But Lucy has barely finished putting up her first batch of Killer Dewberry Jam when an oil exploration truck rolls up to the farm and announces plans to replace her broccoli patch with an oil derrick. December 25 is right around the corner. The last thing Charlie expects is to gain several new additions to his family. Charlie finds a box on his doorstep with five kittens inside and a note begging him to keep them safe. With Diesel's help, Charlie welcomes the tiny felines into the Harris household just as his neighbor Gerry decides it is time to throw a lavish holiday party. Determined to make her mark on Athena, Gerry instead winds up dead at her very own party. Florist Fiona Knox’s life isn’t smelling so sweet these days. Her fiancé left her for their cake decorator. Then, her flower shop wilted after a chain florist opened next door. So when her godfather leaves her a cottage in Scotland, Fiona jumps on the next plane to Edinburgh. But when Ian’s elderly caretaker Hamish MacGregor shows her to the cottage upon her arrival, she finds the once resplendent grounds of Duncreigan in a dreadful shambles - with a dead body in the garden. Minutes into her arrival, Fiona is already being questioned by the handsome Chief Inspector Neil Craig and getting her passport seized. With the help of her rescue cat, Eddie, librarian Minnie Hamilton is driving a bookmobile based in the resort town of Chilson, Michigan. But she'd better keep both hands on the wheel, because it's going to be a bumpy ride.... Eddie followed Minnie home one day, and now she can't seem to shake the furry little shadow. But in spite of her efforts to contain her new pal, the tabby sneaks out and trails her all the way to the bookmobile on its maiden voyage. Before she knows it, her slinky stowaway becomes her cat co-pilot! 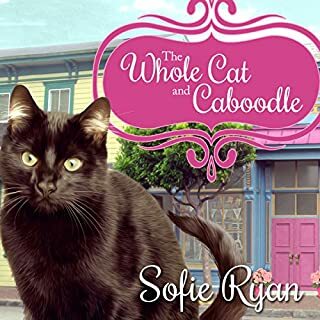 Katie Bonner, the reluctant manager of Artisans Alley in the quaint shopping district of Victoria Square, is no stranger to ambivalence. Things have been going hot and heavy with pizza maker Andy Rust - so much so that Katie has moved in over his pizza parlor. But now that summer's ushered in a heat wave, an apartment above pizza ovens without an air conditioner is making Katie hot and bothered. Another great book in the series! Characters are good, and the storyline is wonderful. Hope there are more to come! Once again Katie has found herself in the middle of drama. Not only is she involved in a dispute with merchant association, but she is also in the middle of a murder investigation. There are many characters and plot twist to keep the story going from chapter to chapter. This book will not disappoint you. 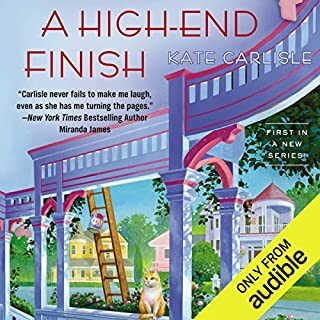 The narrator fit right into the role of heroine/sleuth. The plot moved at a great pace. A very enjoyable mystery. 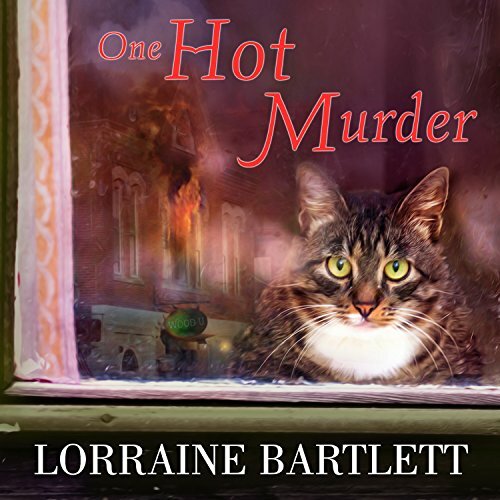 One Hot Murder continues Lorraine Bartlett’s Victoria Square series in which Katie Bonner manages Artisan’s Alley, a cooperative of artists in a large space that is really suffering under the summer heat wave. Just as Katie is leaving her boyfriend’s pizza shop one hot summer night, she notices the smell of fire, and soon the fire department is on the scene where Wood U, a shop that sells souvenirs made of wood, is alight. Inside the shop, the fire department finds the body of a man, but his face is so obliterated by a gunshot blast that no one knows who the victim is. The hot summer heat wave keeps tempers short, especially since Artisan’s Alley is having serious problems with its air conditioning system, with certain areas being kept too cold and other areas stifling from the heat. Food starts disappearing from the vendors’ refrigerator, and Katie finds evidence of a squatter in the alley. Plus, as president of the Victoria Square Merchants Association, Katie is having trouble with the owner of a store in the Square. Further, to Katie’s heartbreak, the Webster Mansion that Katie has longed for many years to turn into a B&amp;B gets sold, and the couple who has purchased it has a vision almost identical to the one Katie has nursed for ages. This book does not follow the same tight plot of a murder investigation of the previous books in the series, but it is effective nonetheless. The many elements of life in Victoria Square fascinate, and things that seem to be unrelated do connect back together, even if only loosely. I really enjoyed this book and its flavor. 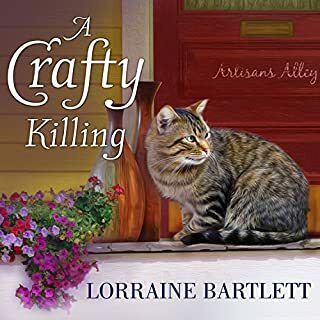 With more than just a murder going on, life at Artisan’s Alley is fascinating and fun. I enjoyed getting to see the way that Katie deals with the many issues in her life. Jorjeana Marie narrates the audio version of this book and does a lot to help bring this book to life. She portrays Katie effectively, and I really like her voice. She also portrays the other characters well, and I’d enjoy hearing what kind of job Marie is capable of doing in another series. I really found One Hot Murder to be a highly enjoyable book. 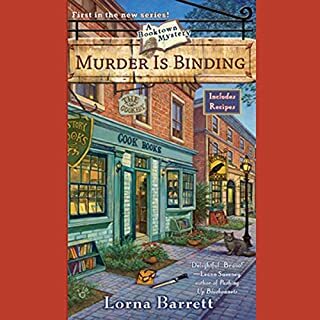 I have come to enjoy the writing of Lorraine Bartlett, and this series is very creatively done. I like the setting of the series and the details found in it. The conclusion was creative and well-written too. I give this book five stars! This is not a predictable plot. There are some great unexpected twists here. As a good plot guesser, this one took longer to figure out what was coming. I can't wait for the next book. 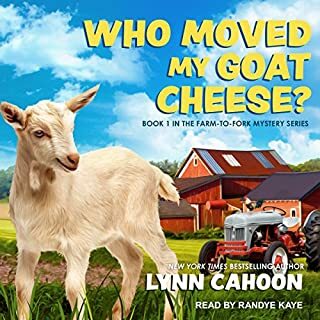 This is a great cozy mystery, which could easily stand on its own, but reading the series in order will add an extra dimension to the plot and reoccurring characters. I really enjoyed this book and I am looking forward to the next one in the series.